Sooo... like my knees predicted (or rather, the weather forecast did) the sun turned to rain. Not that I minded, because Edmonton was getting so dusty it needed a good clean out. The leaves are out and the grass is turning green and everything is happy, and so am I. Its great to see the approach of spring and the weather here turns so quickly, one day you see bare branches out of the window, next day its green shoots everywhere. In a pan, heat the olive oil and add the onions, garlic and celery. Saute for a few minutes until the onion is soft. Add the carrots. Saute again for a few minutes, and add the quorn mince and the thyme. Stir around for a few minutes, then add the tomatoes, puree, stock, Worcester and Marmite. Stir all together and simmer for about 15 - 20 minutes, until the mixture is thick. Season to taste. If it hasn't thickened, simmer for a few more minutes. Leave to cool. Meanwhile, boil and mash the potatoes with the milk and butter. Season to taste. Leave to cool down. In a deep dish (I use my Le Creuset), pour the mince filling, level out the surface. 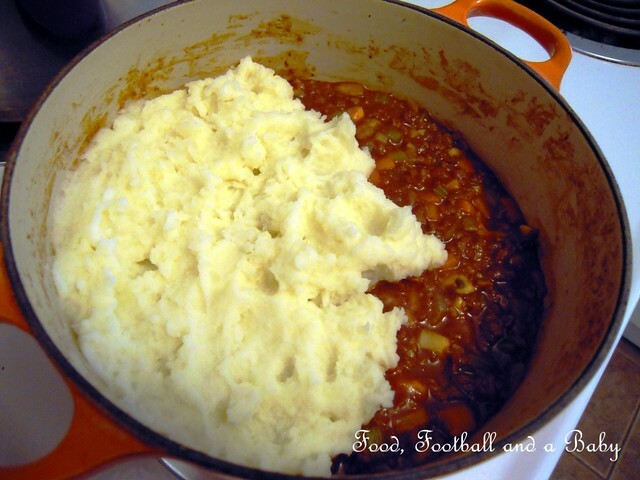 Then drop the mashed potato over it, smoothing it out, until the mince mixture is fully covered, sealing up the edges. 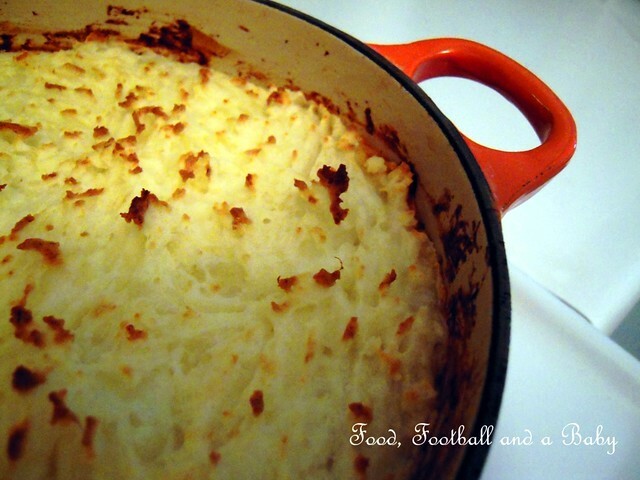 Use a fork to scrape over the top of the potato, as this will give a crisper finish. Sprinkle over the cheese, if using, and bake in preheated oven for about 25 minutes, at around 200 C, until the topping is lightly browned. If the topping is not browned to your satisfaction, put under a grill for 5 minutes or so. Hi Michbot, looks great apart from the veggie bit and I'd love to try it with mince, but I haven't a clue as to what size a 'pack' is in weight or volume; so an idea of weight for substitutes would be really, really appreciated. Ta, muchly please please! Fantastic; thank you hugely... I will indeed try this next week; I'm off to Buckingham Farmer's Market next Tuesday, so I'll pick up some of the in-greedy-ments there! And I have the blue Le Creuset to match your orange one! They cannot be beaten I reckon and I love mine, scuffed and 15 years old as they are.